The Ashfall Fossil Beds of Antelope County in northeastern Nebraska are among the rare preservation sites called lagerstätten, which preserve ecological "snapshots" from a moment in time, due to extraordinary local conditions that have preserved a range of fossilized organisms undisturbed. Ash from a Yellowstone hotspot eruption 10-12 million years ago created this ash bed. 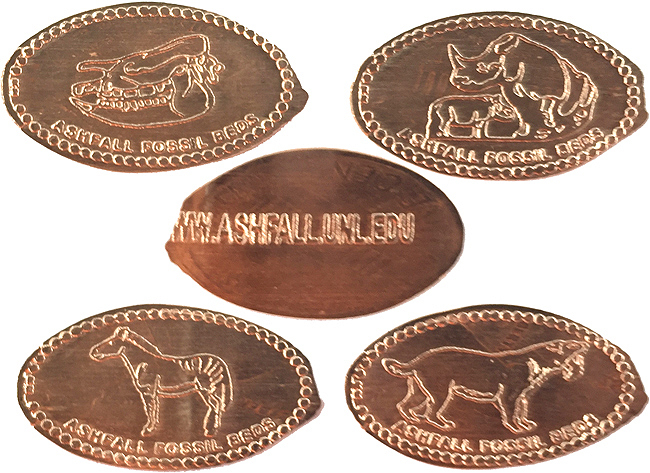 The site is now protected as Ashfall Fossil Beds State Historical Park, which includes a visitor center with interpretive displays and working fossil preparation laboratory, and a building over an ongoing excavation site that features native American rhinos and ancestral horses. The machine is located in visitor center to the right when entering. The machine contains 4 designs and has the Ashfall website on the back. Each design costs $.76. thegillion added Ashfall Fossil Beds to system.